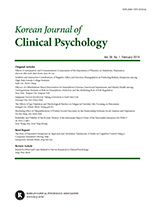 김지연, 오경자,(2011).부모의 과보호가 성인 자녀의 우울에 미치는 영향.Korean Journal of Clinical Psychology ,30(3),647-661. 본 연구는 부모의 과보호가 자녀의 우울에 미치는 영향에 있어서 성차를 확인하고, 부모 과보호가 우울에 영향을 미치는 과정에서 자아탄력성의 매개 효과를 검증하고자 하였다. 이를 위해 서울 지역 대학에 재학 중인 남녀 학부생 233명을 대상(남자 122명, 여자 111명)으로, 과보호 척도, 자아탄력성 척도, 우울 척도를 실시하였다. 연구 결과는 다음과 같다. 첫째, 부모 과보호 및 부모 과보호 하위요인 중 부모 밀착통제, 부모 투사적과보호, 그리고 우울 수준을 남자보다 여자가 유의한 수준으로 높게 보고하였다. 둘째, 변인들 간 상관관계 분석 결과, 남자의 경우 부모 과보호 및 과보호 하위요인, 자아탄력성, 우울 간 관련성이 유의하였다. 반면 여자는 자아탄력성과 우울 간 상관만이 유의하였고, 부모 과보호는 자아탄력성 및 우울과 유의한 상관을 보이지 않았다. 셋째, 부모 과보호가 남자 성인 자녀의 우울에 영향을 미치는 과정에서 자아탄력성의 매개 효과를 확인하였다. 이러한 결과를 중심으로 본 연구의 의의와 제한점에 대해 논의하였다. The purpose of this study was to examine the gender difference of the mediation effect of ego-resilience in the relationship between parental overprotection and depression. Two hundred thirty three undergraduate students participated in this study and they completed the questionnaires on parental overprotection, ego-resilience, and depression. The results were as follows: (1) female students reported significantly higher levels of parental overprotection, adhesive control, projective overprotection, and depression than males. (2) For males, parental overprotection was significantly associated with the levels of ego-resilience and depression, and there was also a significant association between ego-resilience and depression. On the other hand, for females, ego-resilience was significantly associated with the level of depression, but parental overprotection was not significantly associated with ego-resilience or depression. (3) In the male group, the relation between parental overprotection and depression was mediated by ego-resilience. We also discussed the implications and limitations of this study.